Once you’ve invested hours into building an email templates that clients can edit, the most frustrating thing that can happen is for them to break it when adding content. The problem is, not all clients are tech-savvy, and not all email templates are easily editable without some knowledge of HTML and CSS. Maintaining the relationship between you and your client is a priority. You’re providing them with a service, and it needs to be good enough for them to stay, and if you’re lucky, tell other people about how awesome your agency is. However, if you’re creating templates that clients can easily break, they’re going to come back and blame you and get you to clean up their mistakes – you built the email template after all! Not only does a broken email make a client’s brand look unprofessional, but it can damage your reputation as a leading email marketing expert. There’s a lot that goes on behind the scenes when creating an email. Your clients will often want to insert personalised content into their email campaigns, but if there’s the slightest difference in font size, images aren’t referenced correctly or are the wrong dimensions, then we all know too well this could cause display issues in certain email clients. Just think about how much time you spend testing out emails to ensure that these errors don’t occur. But these errors shouldn’t happen in the first place, should they? Your clients should be able to go in to your template and freely update it with the content they need, without having to worry about code, or any of that complex stuff that only us tech-geeks understand. We know it’s a pain and we’ve listened to your concerns, so that’s why we have updated our email designer feature for the better. We’ve updated our platform so that when you create your own templates using some custom markup, they can be edited in our drag and drop email designer. The control is now in your hands to decide what the client can and can’t edit. 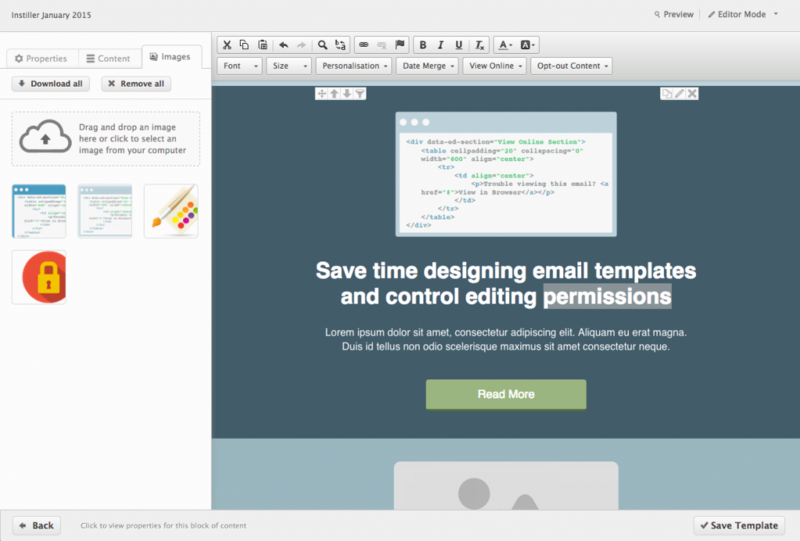 So now when you now design your beautiful templates for your clients, it will be impossible for them to break the email. So you don’t have to worry about clients sending out broken emails and you protect their reputation as a brand. As you’re doing all the design and essentially providing them with less options to edit, your clients don’t need to have any coding skills to add content to their email. They simply add their text and image content into areas you allow them to, using our inline text editor and drag and drop image library. Not only is it painless for your clients, but it also speeds up your working day as you only need to create the template once and add it to your clients template library. So for example if you help clients send out a monthly newsletter, you will only need to build the perfect template once, and your client can continue to use it going forward. So there’s no more clients calling you up complaining about a broken email. You design the template to their liking, and they simply drop in their content and edit the email, without the need for any code! It’s that simple. Our update is in place now, so you can start creating unbreakable templates straight away. If you would like any more information about how our email designer feature can help your agency, don’t hesitate to contact us today.